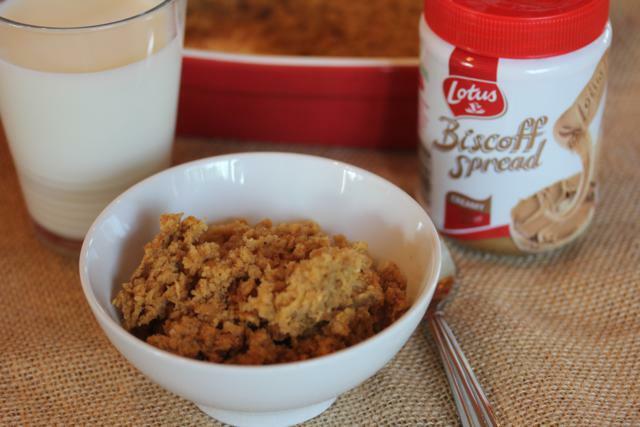 You all know I love baked oatmeal, so baked oatmeal and Biscoff Spread seemed like a natural fit to me. I have been seeing Biscoff and Biscoff Spread all around the internet for the last few months. I have some seen some great recipes using it and heard people rave about how wonderful it tastes, but no one in my family had ever tried it. It has gluten in it after all and some in my family eat gluten free. When I was contacted last month though about developing a recipe using Biscoff, I knew it was the perfect time for my husband and son to try it. Because of my daughters’ and my food issues, my husband and son sacrifice a lot, so I knew they would love to try Biscoff for a treat. And love it they did! 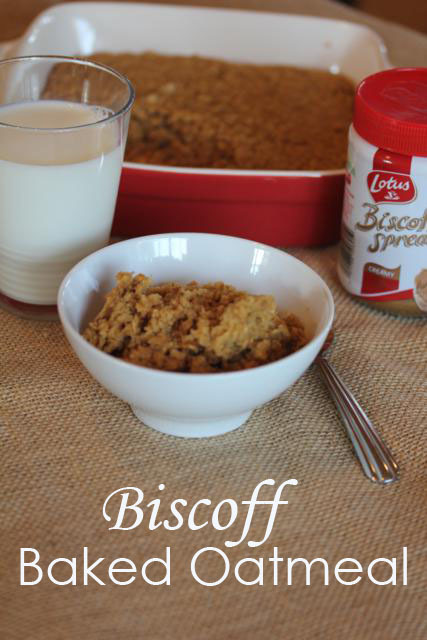 If you are not familiar with Biscoff it is a delicious spread that is made from Biscoff cookies. It is a fun alternative to nut butters and chocolate spreads. Some of you may be asking what a Biscoff cookie is, well it is a European cookie first made in Belguim in the 1930’s. It has gained popularity over the years and originally came to America as an in flight treat. Now both Biscoff spread and Biscoff cookies can be found in stores all over the United States. My son now thinks the Biscoff Spread is the best. He will eat it by the spoonful. He will eat it on pancakes, bread, and just about anything else. My husband agreed. He told me that I need to buy more and keep it on hand. 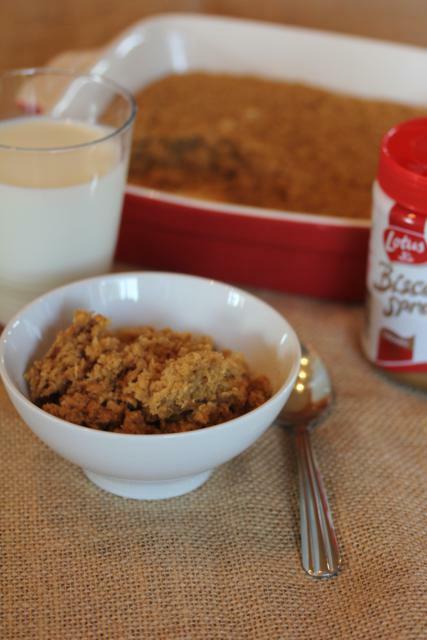 When I saw that Biscoff Spread had about the same texture as peanut butter, I knew it would would great to adapt my peanut butter baked oatmeal and use Biscoff instead of peanut butter. I made a pan of this one day last week for my husband and son and it was gone in no time. They loved it! My son even had a big bowl of it with fruit on top. They loved the flavor it gave the baked oatmeal and informed met that I could make this anytime I wanted for breakfast. I think they may just have a new favorite way to eat baked oatmeal. Spread into a greased 8×8 pan or casserole dish.